I Went Quackers Over This Duck! 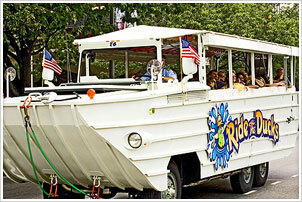 In all honesty, I wasn’t really looking forward to my Ride The Ducks special press tour yesterday. I thought it was going to be another dumb, touristy ride and really thought I knew most everything about San Francisco. WRONG…and on so many levels.It turned out to be the most fun I’ve had on dry land in some time, and the wet part wasn’t too shabby either. As we climbed aboard the big amphibious duckster we were each handed a duck-quacker to quack along to the rip-roaring music or just if you spotted a cute guy walking by and wanted to give him a quack of approval. We were very lucky to have scored “Capt. Cranky” as our commander-in-chief for the ride. He regaled us with all sorts of fascinating stories and behind-the-scene historical tidbits about San Francisco’s colorful past. For 90 minutes Capt. “C” took us through Fisherman’s Wharf, Chinatown, Union Square, SOMA and down by the Bay Bridge where, in theory, we were supposed to drive down into the bay and cruise McCovey Cove. However, after ducking into the bay, we got about 20 feet and then nada. Our duckster was stuck in the bottom and there was no going further. The evening tide was out and it wasn’t coming back anytime soon. Check the website for dates and times and special Bay Area resident rates.